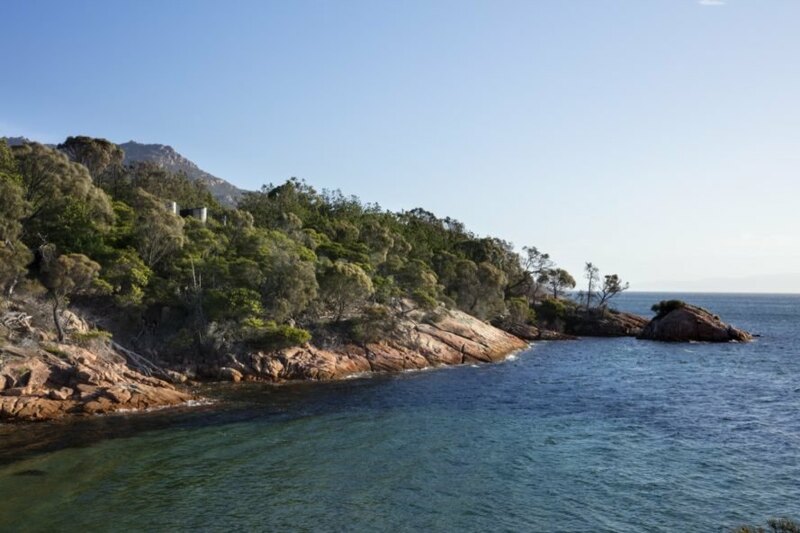 If you’ve ever dreamed of visiting Tasmania, you’ll want to put Freycinet’s newest additions on your bucket list. 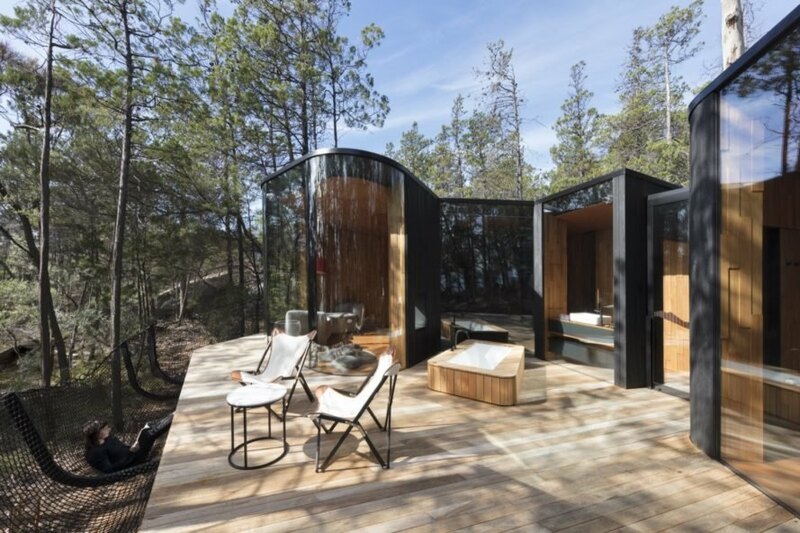 Nestled inside one of the country’s oldest national parks, this unique hotel recently saw the completion of its nine Coastal Pavilions, a series of prefabricated one-bedroom cabins designed by Liminal Studio that blur the lines between inside and out. Inspired by the spectacular surroundings, the pavilions are fitted out with a natural material palette, full-height glazing and rounded, sinuous surfaces that evoke an organic feel. 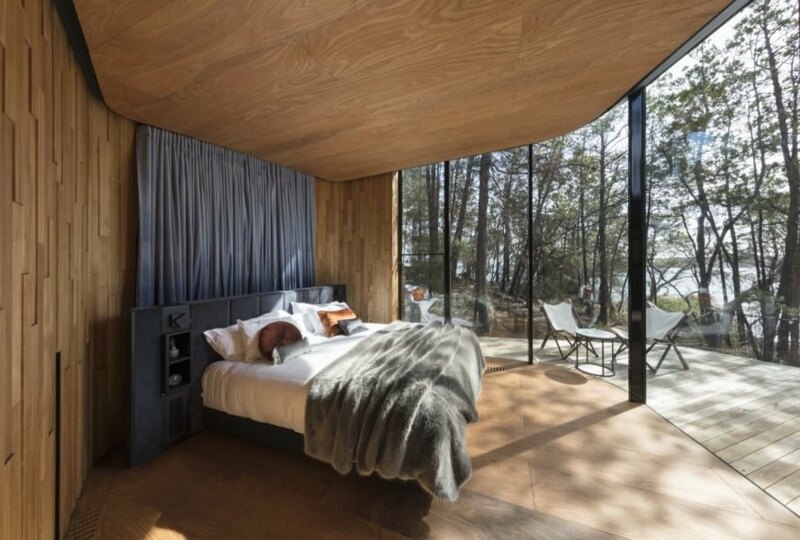 Located on a wind-blown pink granite outcropping on the Freycinet Peninsula in Freycinet National Park, the new Coastal Pavilions at Freycinet Lodge were prefabricated offsite for minimal site impact. Each pavilion was carefully placed to provide privacy and an immersive experience while maximizing views. As a result, not all of the pavilions have water views as some are nestled into the coastal bushland; the pavilions comprise two types, Coastal Pavilions and Coastal Pavilions – Bay View. 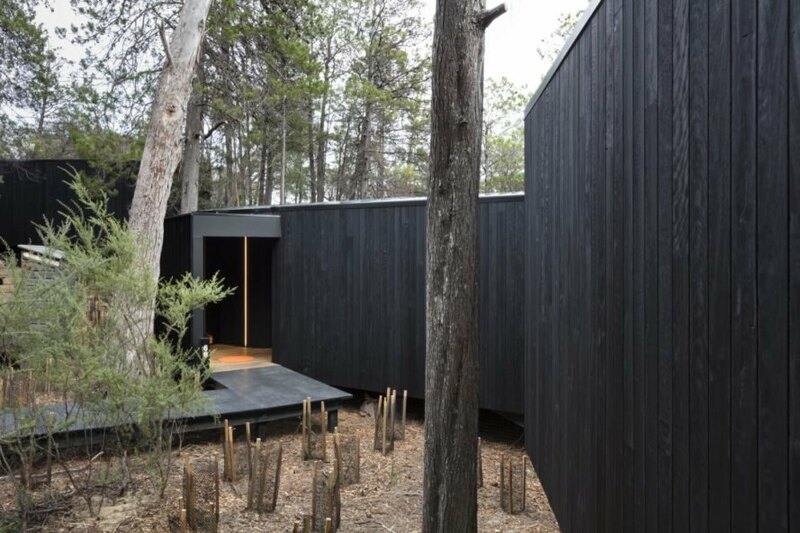 All of the contemporary pavilions are wrapped in charred ironbark that helps recede the buildings into the landscape, as well as full-height double-glazing. Netted, hammock-like balustrades surround the timber deck complete with an outdoor soaking tub. 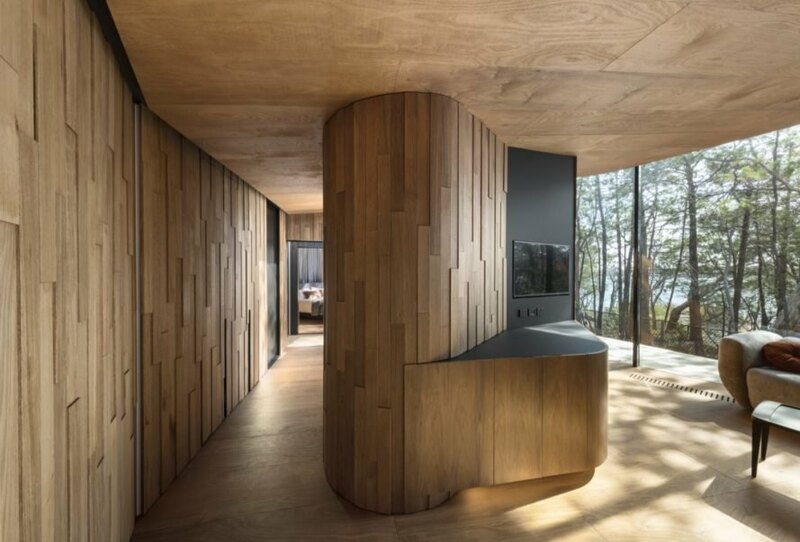 Inside, local Tasmanian timbers are used throughout to create the highly textured walls, ceilings and floors, which flow together with sinuous lines devoid of hard corners. In addition to a large bedroom, the pavilion is equipped with a living area and walk-in shower. The pavilions have an outdoor deck and tub. 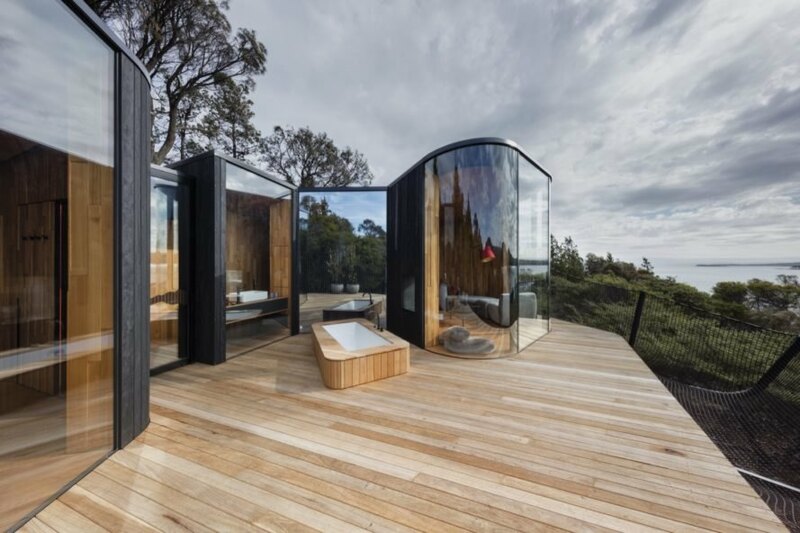 The cabins are set on the pink granite outcropping of Freycinet National Park. Charred ironbark clads the exterior. Curved walls of glass wrap around the front of the pavilion. Some cabins are nestled further into the bushland. The pavilions are built to sleep two. Curved, highly textured walls finished with timber bring the outdoors in.